Hear the Sound of My Feet Walking.. Drown the Sound of My Voice Talking.. ORIGINAL PRICE: $3.95; $4.95 for 1975 printing. 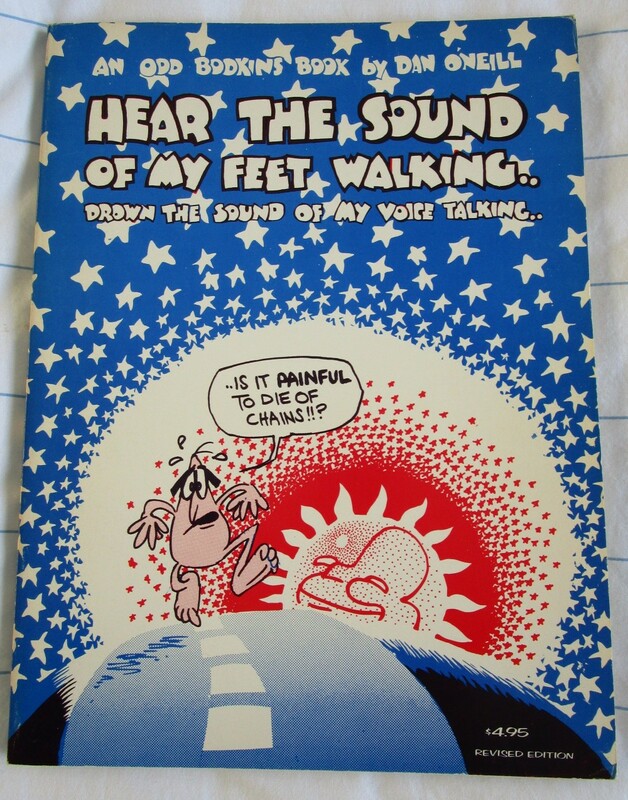 (c) 1969 Chronicle Publishing Co.
Dan O’Neill’s book Hear the Sound of my Feet Walking.. Drown the Sound of my Voice Talking.. (1969; rev. ed. 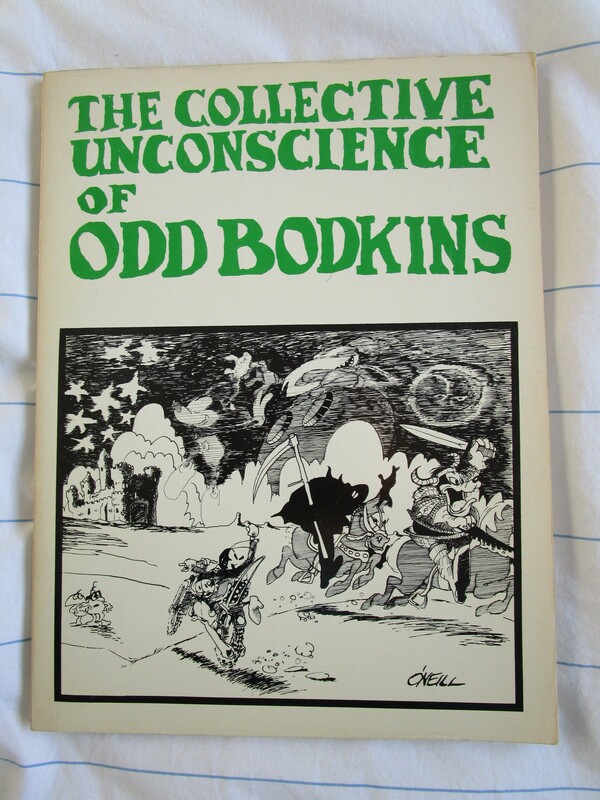 1973) brought together his comic strip Odd Bodkins in one large book (132 pages including covers, 12” by 9”); Odd Bodkins was first published in the San Francisco Chronicle and then syndicated in other newspapers. 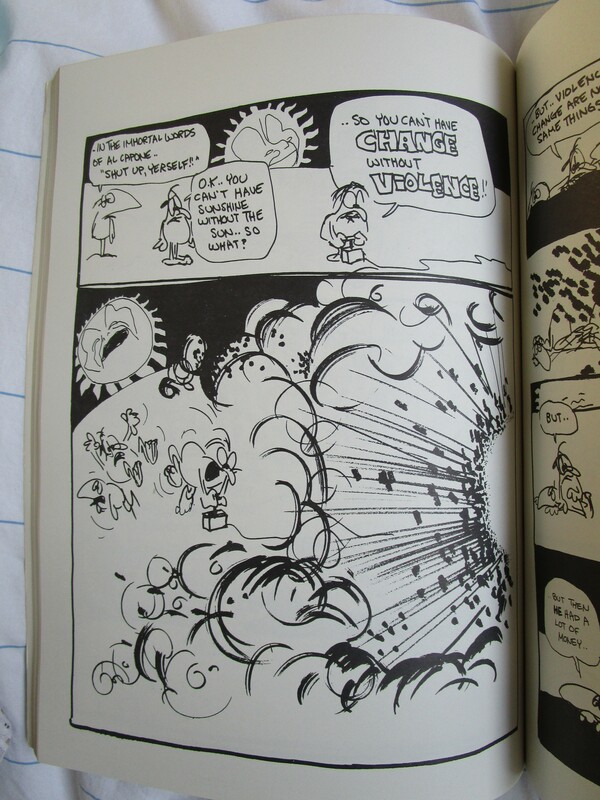 O’Neill is probably best remembered in American comics history for being part of the Air Pirates collective, a group of underground creators who were successfully sued by Disney for depicting the corporation’s copyrighted characters in lewd, drug-taking scenarios. There are twinklings of the Air Pirates controversy in Hear the Sound – a figure looking very much like Mickey Mouse cries “Dirty commie Jewish monolithic hippy anarchist!” [125-26] and tries to shoot one of the main characters with a machine gun – but I’m interested in how the book can be read as an extended meditation on the counterculture at the end of the 1960s. Fig. 1. 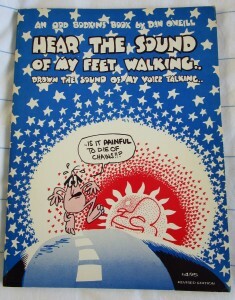 Hear the Sound of my Feet Walking.. Drown the Sound of my Voice Talking.. (c) 1969 Chronicle Publishing Co. Page . Fig. 2 and 3. 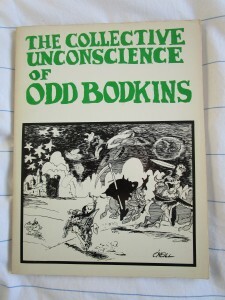 Cover and interior pages from The Collective Unconscience of Odd Bodkins (c) 1973 Chronicle Publishing Co.
As well as being different from Collective Unconscience, O’Neill’s 1969 reprint collection was unlike other early softcover collections of underground comix, such as R. Crumb’s Head Comix (1968) or the multi-authored paperbacks Wonder Wart-Hog, Captain Crud, & Other Super Stuff (1967) and Swift Comics (1971; also known as Swift Premium Comics). Hear the Sound stands out because it offered readers a book-length sequential art narrative populated by recurring characters. Successive chapters clearly follow on from one another: for example, the concluding relationship between characters at the end of chapter 4 is relationship with which chapter 5 begins (see fig. 4). Continuity of space, time and character, however, do not guarantee that Hear the Sound is a narrative; better yet, we might say it has the vestige of a narrative, but not one that moves a great deal. Characters do interact in time, and on a local level their actions trigger reactions that usher some supporting characters out and others in, but at a global level the text is essentially atemporal. Todorov’s seminal formulation of the “minimal complete plot,” the movement from an original “equilibrium” through an “imbalance” to a “different” equilibrium, is not easily mapped on to Hear the Sound (75). There are undeniably disruptions that detain Fred and Hugh from their strolling and philosophizing, but these are always temporary. 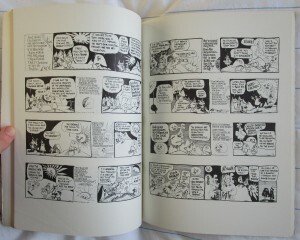 Comics scholar Jared Gardner discusses Art Spiegelman’s “Little Harold Sunshine” (1967) as an example of an “acid-trip narrative” told “in a serial-strip format”; Spiegelman’s strip, in which “Harold’s adventures take him precisely nowhere,” bears strong comparison to Hear the Sound (Gardner 123). Fig. 4. Hear the Sound of my Feet Walking.. Drown the Sound of my Voice Talking.. (c) 1969 Chronicle Publishing Co. Pages [40-41]. At the conclusion of the book, the two main characters (Fred Bird and Hugh) are as they were at the start, which is the same state they exist in at various intervals throughout: they are walking along a road musing on philosophical conundrums. Hear the Sound is made up of somewhat self-contained episodes, with titles used to signify a new stage of the story, although after the first chapter the end of each episode clearly segues into the one that follows. The order of events is irrelevant: it would make no difference if the discussions took place at different times (since they lead nowhere), or if characters entered the narrative earlier or later (since the essential relationship between the main characters and their environment does not change). 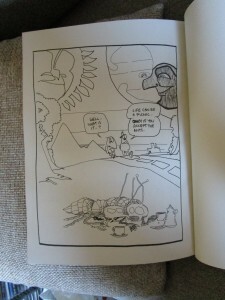 The book’s penultimate page feints a denouement, a nugget of wisdom, as Hugh tells Fred he has “learned one thing.”  We turn over to the last page, anticipating a revelation, and we get a full-page spread, using the maximum possible area to fix one’s attention on this concluding tableau and the promise of enlightenment. Hugh’s observation is trite and contains no insight: “Life can be a picnic.. ..only if you accept the ants..”  In fact, the observation seems nothing more than the cue for a visual gag, two giant ants drinking tea (I assume) on the grass as Fred and Hugh stroll in the middle distance (see fig. 5). Like the gag in the final panel of a newspaper strip, eliciting laughter before the strip continues the following day, the end of Hear the Sound is where the comic ceases but not where it concludes. Fig. 5. Hear the Sound of my Feet Walking.. Drown the Sound of my Voice Talking.. (c) 1969 Chronicle Publishing Co. Page . The “lack of any coherent sequence” or “restitution” in the plot of Hear the Sound chimes in my head with the notion of the “chaos narrative” (97) as described by the medical humanities scholar Arthur W. Frank in his 1995 book The Wounded Storyteller. Frank provides a typology of self-narrations of illness and one of his categories, chaos narrative, refers to stories that do not have an upward trajectory ending with health and restoration. The chaos narrative is “an anti-narrative of time without sequence”; the first example Frank gives is a story with “no narrative sequence, only an incessant present with no memorable past and no future worth anticipating.” (98-99) Hear the Sound is not, of course, a first-person narration of illness or physical impairment, but it bears out the essential character of Frank’s chaos narrative, that events are occurring but nothing is changing on a structural level that would give us faith that the future will look different from the past. Some of those interruptions shed light on the historical context of 1969, the year in which Hear the Sound was published. Earlier in the decade student-led anti-war activism and the support given by young protestors to the African-American Civil Rights movement had fostered an acute consciousness of intergenerational antagonism in American society. As the 1960s dwindled to an end it seemed more obvious every day that the forces of the American government would respond to anti-war protests with violent repression, two notorious examples being the repression of the march on the Pentagon in 1967 and at the Democratic Party’s convention in Chicago in 1968 (Marwick 545, 668-69). By 1969 the main political organisation of the youth movement, the Students for a Democratic Society (SDS), was fragmenting: some ex-SDS members called for a Leninist vanguard party to spearhead an American revolution, whereas others formed the Weathermen (later the Weather Underground), a secret organisation that waged war against the US government. The Weathermen’s activities included bombing symbolic targets (Heale 146; Marwick 746-51). 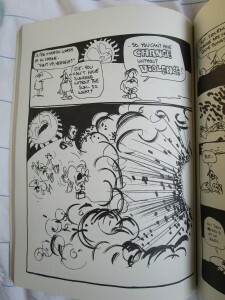 One of the minor characters in Hear the Sound embodies the countercultural move towards forcing political change by acts of violence, a scruffy-haired man with a moustache who frenetically sets off machine guns and cannon fire into the landscape (he is firing at no discernible targets) as he proclaims “you can’t have change without violence! !”  (see fig. 6). This character turns out a stream of statements that drip with the ambience of the counterculture; when this character snarls “People who love you load you with chains.. one upon the other.. until the chains grow so heavy you aren’t there anymore..”  he could be paraphrasing the work of R. D. Laing. Laing, a Scottish psychiatrist who pioneered highly unorthodox therapeutic methods in the 1960s, enjoyed enormous popularity in America as an intellectual leader of the counterculture (Staub 64; see also Burston). He would go on to write more radical texts, but in 1960 Laing published The Divided Self, a book identifying family life as a smothering, pathological environment in which authentic selfhood is thwarted and one’s being is jeopardised. Another of the moustachioed revolutionary’s sayings – “The jester is the only one who knows the end of the joke”  – could almost be a line from Bob Dylan’s “Subterranean Homesick Blues,” the song from which the Weathermen took their name. Fig. 6. Hear the Sound of my Feet Walking.. Drown the Sound of my Voice Talking.. (c) 1969 Chronicle Publishing Co. Page . At the end of the Second World War the so-called ‘baby boom’ occurred in America, a demographic explosion that stemmed from servicemen and women returning to civilian life and starting the families they had deferred while the conflict was ongoing. The counterculture was closely associated with this bulging youthful population and their angst is audible when the revolutionary in Hear the Sound laments “the instability of my war baby generation” . ** Fred and Hugh also seem to represent the generation coming of age in the 1960s, with comments flung at them such as “You kids have no respect for your elders” , and when Hugh calls out for God to show himself, a watching turtle complains “his whole generation is a bit loud” . Hugh is the more philosophical of the two, but one feels they are both questing to find meaning in their lives, searching for a value structure which living by will make sense. To the older, more conservative characters in Hear the Sound (Lucille Marie Gartersnake and the cantankerous turtle in the opening scene) Hugh and Fred symbolise their entire disrespectful, noisily restless generation. 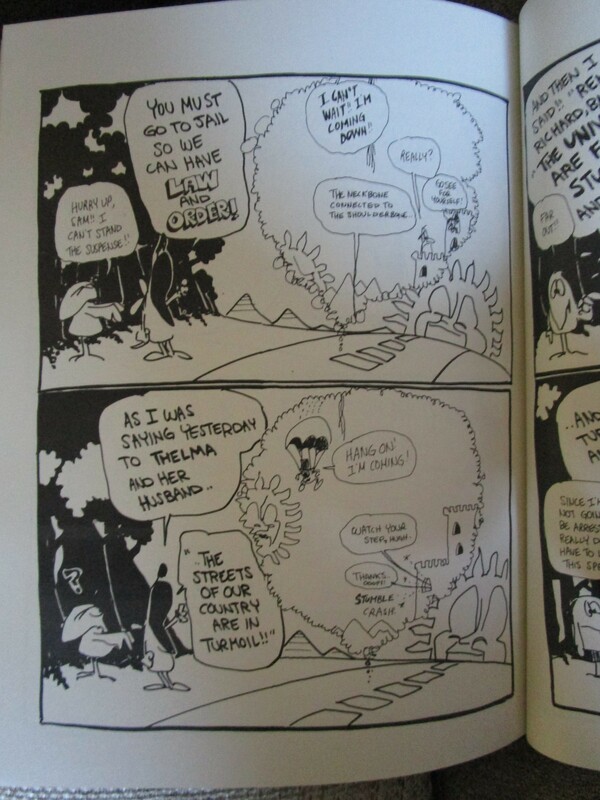 To give further evidence of Fred and Hugh’s affinities with the counterculture, near the end of Hear the Sound they eat some magic cookies and access an intra-diegetic hallucinatory environment (by which I mean they disappear from their existing narrative space and reappear in a new space within their thought balloons) (see fig. 7). Some of the minor characters also point to a fractured relationship between the counterculture and the United States of America, such as Batwinged Hamburger Snatcher, whose quest is to wipe out all hamburgers because they represent America to the wider world [30-31]. During their meanderings Fred and Hugh encounter some personifications*** of the polarised political positions of the late 1960s, such as Carl Marks the commie turtle, and Sam the 100% American Dog, who dines with Richard and Pat Nixon. Fig. 7. Hear the Sound of my Feet Walking.. Drown the Sound of my Voice Talking.. (c) 1969 Chronicle Publishing Co. Page . Frank’s chaos narrative is subject to “life’s fundamental contingency,” where subjects have lost their sense of agency (102-03). We can take this back to Hear the Sound to understand the construction of its narrative as an emblem of countercultural anxiety in the late 1960s. This is not so different from what Frank does with his theory; he postulates that the failure of chaos narratives to get a hearing with doctors, scientists and other medical professionals is due to modernity’s fixation on progress, an obsession with what can be fixed and improved (111-14). In the late 1960s the socially transformative potential of the youth movement was sliding into violence and the American state was also going to more extreme measures to counter the avowed threat of revolution. The very youth movement of the 1960s seemed to be deviating from Todorov’s “minimal complete plot,” which was meant to culminate in a revised equilibrium. 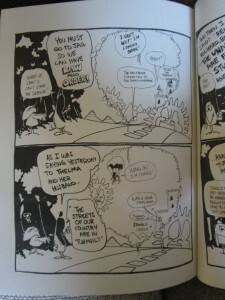 No wonder, given this crisis of direction affecting the counterculture, that O’Neill’s “metaphysical cartoon novel” eschews a bold narrative; no wonder that Hear the Sound permits small imbalances in the plot only to return, time and again, to the stasis of Fred and/or Hugh’s perambulations. 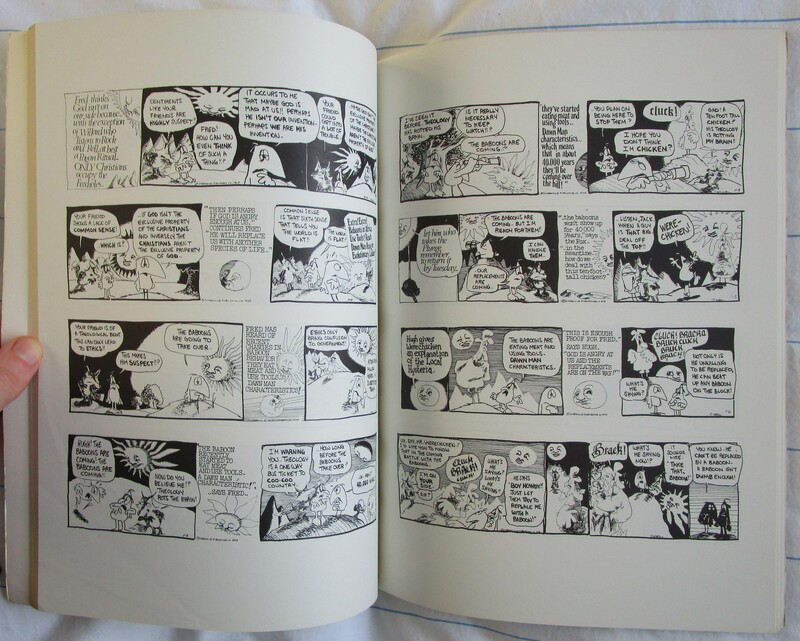 The book’s “frenzied but flat” (Frank 103) narrative speaks to the uncertainty about the countercultural project that had set in, certainly by 1969. The ability of Fred and Hugh to endure the events of the book and make it through to the final page is worth one last comment. They have survived, and if no higher or nobler set of relations has been reached, then the equilibrium with which they began the book is nonetheless resumed. This is a pragmatic qualification to countercultural optimism, and not a source of despair. In Hear the Sound the representatives of the youth movement cannot overvault the existential questions and dramas of 1960s America, but despite the efforts of Sam the 100% American Dog and the murderous, dogmatic (sorry) nationalism he represents (Sam morphs into Adolf Hitler after eating a magic cookie), the emissaries of authoritarianism have not triumphed. The protagonists are free to keep walking and philosophizing, and they may find the answers to their metaphysical questions yet. 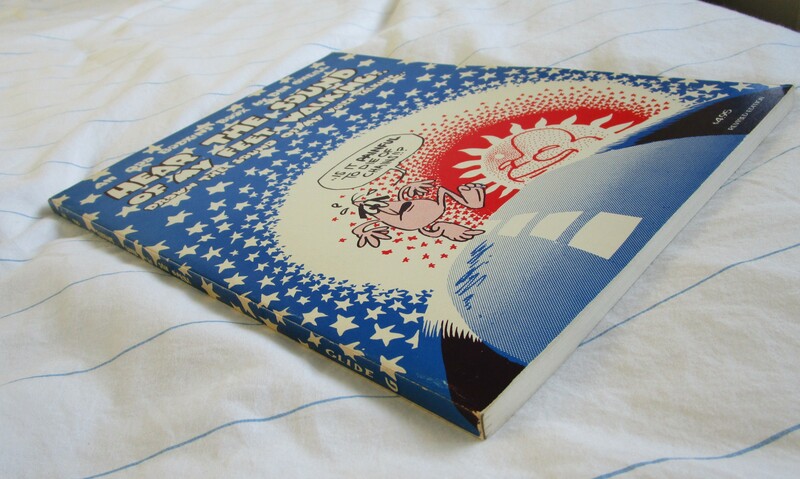 * Information about the date and cost of the 1969 and 1973 editions is from Jay Kennedy’s The Official Underground and Newave Comix Price Guide. ** It is possible the revolutionary is referring to babies born during the conflict, although this group would only be slightly older than the boomers. Where sources lack pages numbers I have determined them by counting the front cover as  and numbering the following pages accordingly (including recto and verso sides, regardless of whether they had been printed on). Page numbers arrived at using this system are presented in square parentheses. Burston, Daniel. The Wing of Madness: The Life and Work of R. D. Laing. Cambridge, MA: Harvard UP, 1996. Print. Frank, Arthur W. The Wounded Storyteller: Body, Illness, and Ethics. Chicago: U of Chicago P, 1997. Print. Gardner, Jared. 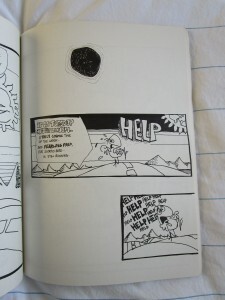 Projections: Comics and the History of Twenty-First-Century Storytelling. Stanford: Stanford UP, 2012. Print. Heale, M. J. The Sixties in America. Edinburgh: Edinburgh UP, 2001. Print. Kennedy, Jay. 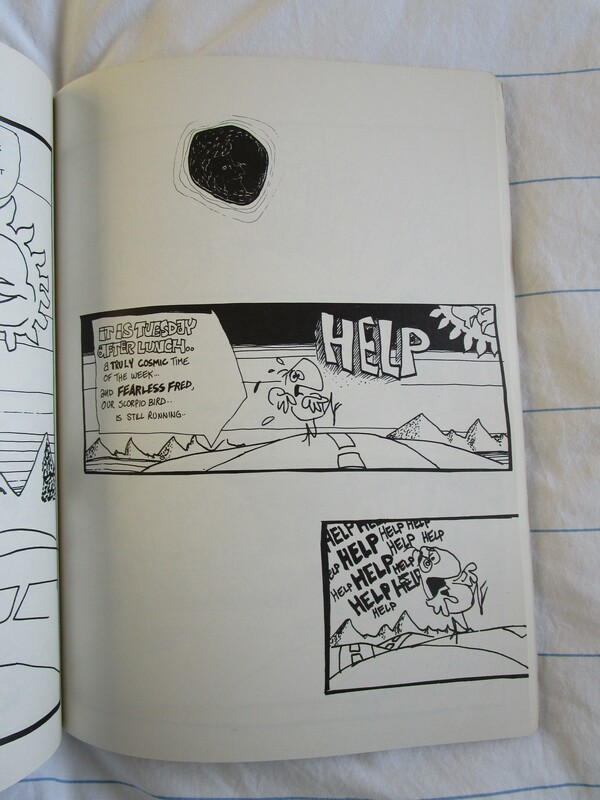 The Official Underground and Newave Comix Price Guide. Cambridge, MA: Boatner Norton Press, 1982. Print. Laing, R. D. The Divided Self: An Existential Study in Sanity and Madness. 1960. London: Penguin, 1990. Print. Marwick, Arthur. The Sixties: Cultural Revolution in Britain, France, Italy, and the United States, c.1958-c.1974. Oxford: Oxford UP. 1998. Print. Staub, Michael E. Madness is Civilization: When the Diagnosis Was Social, 1948-1980. Chicago: U of Chicago P, 2011. Print. Todorov, Tzvetan. “Structural Analysis of Narrative.” Trans. Arnold Weinstein. NOVEL: A Forum on Fiction 3.1 (1969): 70-76. JSTOR. Web. 12 Dec. 2014. This entry was posted in Uncategorized on 13th Dec, 2014 by Paul Gerald Williams.